As a big fan of practical kitchen and home organization supplies, I was really excited when the team at Newell brands offered to provide me with a few review samples of their newest Ball® jar styles to check out (play with?). Having grown up in a home where my mom used the traditional jars for canning delicious concoctions (fig preserves... yum!) and other 'off-label' purposes (aren't Mason jars intended to store safety pins? ), I have long enjoyed using these multi-functional jars. While Ball® Canning Jars were designed for canning produce, over the years they have also been widely adopted for many additional purposes. From serving as drinking glasses in some homes and restaurants to storing various household items and supplies and serving as containers for make-ahead 'Mason jar' salads, these multi-purpose jars are quite popular. It's no surprise that Newell Brands, makers of Ball® Fresh Preserving Products, have introduced some new styles to the market! The new styles are also designed with the needs of crafters and those looking for simple ways to organize things around the house in mind. 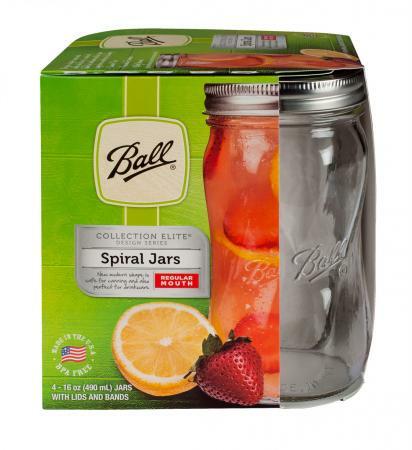 If you are looking for a home canning container with an updated appearance, look no further than the new Ball® Collection Elite® Spiral Jar. Available in both 16 ounce and 28 ounce sizes to meet all of your home canning needs, this style features a gentle twist in the glass while retaining all the functionality of traditional Ball® jars. It's ideal to use whether you are preserving seasonal bounty to stock your own shelves or for gift giving purposes. Of course, you aren't limited to using this style for food preservation. The innovative twisted shape allows these jars to work perfectly as beverage glasses and provides a modern twist (pun-intended) on casual drinking glasses. They are the perfect option for serving sweet tea, and any other chilled beverage of your choice! The fact that they come in two different sizes also makes these jars a great option for storing various household items, including crafting and office supplies, as well as for creating tasty "salad in a jar" recipes, which is my favorite way to use them. If you like to use Ball® Jars for non-food storage, chances are that you have wished that they were available in a much smaller size. Now they are! These miniature jars are much smaller (four-ounce) versions of the traditional pint jars, making them perfect for storing tiny crafting items such as beads or sequins, sewing supplies like buttons or straight pins, and household supplies like push pins or thumb tacks. My husband uses this style to sort and store various small but important items in the garage (nuts, bolts, washers, etc.). 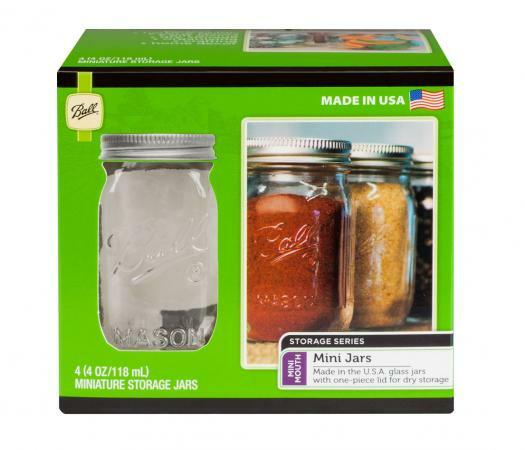 While this style isn't recommended for canning (it comes with a one-piece lid; canning seals aren't available), it does have applications for the kitchen. For example, these containers are a great option for people who order supplies in bulk and need a right-sized airtight storage solution. It's also a terrific solution if you want to package beverage mixes (such as cappuccino mix, coffee or cocoa) to take to work with you or to give as gifts. This style deviates from the traditional look the most. In appearance, it's a cross between the original Ball® Jar style and a canister - and that's exactly how it can be used. The lid is attached to the jar by a piece of wire (the wire bail referenced in the product name) that goes around the mouth. It raises and lowers via an easy-open latch. 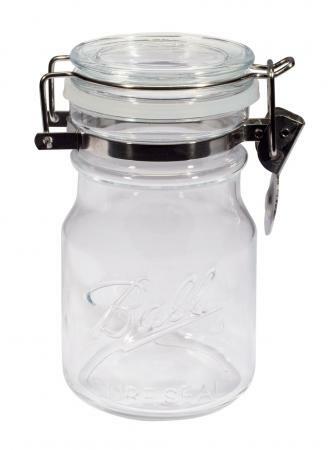 While the jar has a food-safe, airtight gasket seal, it is not intended to be used for canning. Instead, it is ideal for storing dry food items, such as dried beans, rice, coffee, etc. It is a practical and attractive option to hold gifts in a jar food mixes, such as cookies or soup in a jar. Of course, as with all Ball® jars, food is not the only option. This style can also be used to store various crafting and household items. It comes in different sizes than the other new styles (14 ounces and 38 ounces), so the size or volume of what you need to store might lead you to choose this option. Another factor to consider is that this style is perfect for items that you'd prefer to access via a flip-top seal. I find the largest size to be ideal for storing cotton balls in the bathroom, for example. If you're a fan of Ball® jars in general, you are sure to quickly fall in love with these new styles. If you react like I did, you'll immediately start finding new and creative ways to use them around your home and work them into your gift-giving plans as well. You may even come up with crafting project ideas where the jars are featured rather than just being used to store supplies. The new styles, as well as the full product line, are available from FreshPreserving.com. You can also find these jars at a variety of retail stores, including Target, Tractor Supply and Jo-Ann Stores. Note: The author received review items for this piece at no cost. The opinions presented here are her own.